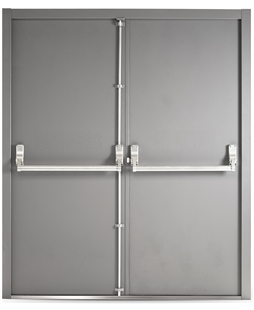 Our Fire Exit Doors are created using the same strong components that all of our Steel Security Doors feature, with the added bonus of a crash bar. It is this bar that makes these doors perfect Fire Exit Security Doors. The internal push down handle within these doors does not mean that their security is compromised. In fact these security doors have a pre-installed multipoint locking system that is both drill and impact proof. To ensure that these doors live up to your commercial property’s needs, they are also fitted with hinge bolts. 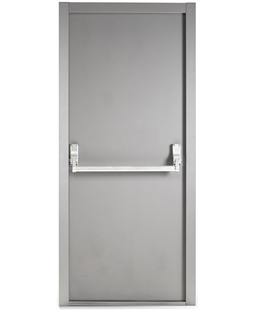 These Fire Exit Doors come in Grey as standard and are available with a single leaf or as a double door. To create doors that are as strong as possible, the 50mm thick door leaf has 2 steel strengthening supports, if you choose our double door then the inactive leaf will also have shoot bolts. As with all of our doors that we feature on our website, included within our metal security door prices is the measuring and fitting of the door, as well as the VAT and a 10 year insurance backed guarantee. Please contact us for free on 0800 955 0898.